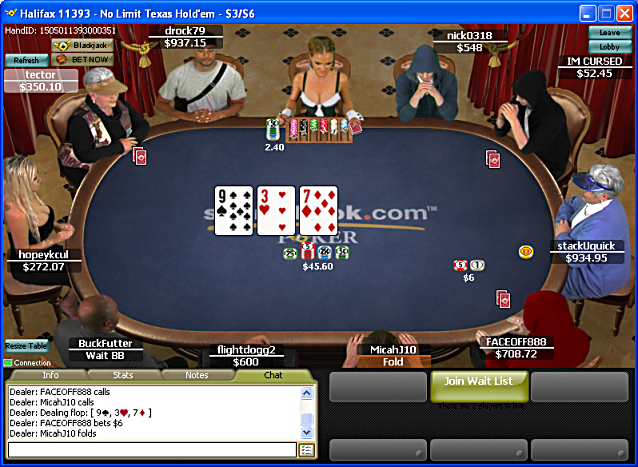 Sportsbook Poker (www.Sportsbook.com) is an online poker room that opened for business in 2006 on the Cake Poker Network, but has since moved to the Merge Poker Network. Although the poker room is relatively new, the Sportsbook.com betting site has been on the Internet since 1997. In 2006, Sportsbook.com decided to enter the poker business and increase its lineup of betting options. Sportsbook Poker is one of our top rated online poker rooms. Sportsbook is a leading skin on the Merge network, meaning that there are tons of players online at all times. Plus, the competition is extremely fishy as most players wander to the poker room from the sportsbook or casino. Plus, Sportsbook.com is currently running a special promotion for all BestPokerSites.org visitors - sign up through any of the Sportsbook.com links on this page and use bonus code BEST1000PK upon deposit to automatically receive a 100% up to $1,000 deposit bonus. So far, the Sportsbook.com poker room has been an impressive new poker site. US and Canadian players are accepted and the player traffic at the poker site is solid. The Cake Poker Network is growing at a steady rate and new players are joining every day. Despite a short history on the internet, the Sportsbook.com poker room has proven to be a popular choice for online poker players. New players who sign up and use the Sportsbook bonus code BEST1000PK will qualify for a 100% bonus on their first deposit there. This bonus gives players up to $1,000 in extra cash after making a deposit. This is one of the larger poker deposit bonuses out there and it is not very difficult to clear. To enter the bonus code, make your first deposit then go to the Rewards tab in the Sportsbook poker lobby. In order to release the bonus, players must play in real money poker games and earn frequent player points. Every FPP a player earns is worth $0.06 in bonus money, and the money is released in $10 increments. Players have a total of 90 days to clear this bonus, which should be plenty of time. FPPs are earned at a rate of 1 FPP per dollar paid in rake in cash games and at a rate of 7 FPPs per $1.00 paid in tournament fees. For a further discussion of the bonuses/promotions, check out our complete Sportsbook Poker bonus guide. Multi-tabling is allowed at Sportsbook.com and the software runs well without interruptions or slowdowns. Note taking and text-based hand histories make analyzing your play after each session a breeze. Overall, the Sportsbook.com poker software doesn’t go above and beyond the norm but it works well and offers players exactly what they came for: non-stop poker action. Sportsbook.com doesn’t have as many tournaments as some of the bigger poker sites but that isn’t necessarily a bad thing. There are still $5,000,000 in guaranteed tournaments every month, including a once-a-month $250,000 guarantee and a weekly $125,000 guarantee. The tournament players here are softer than average and the tournaments don’t take as long as they do at some of the bigger poker sites out there. In addition to normal freezeout tournaments, Sportsbook.com also hosts a variety of other tournaments such as turbos, lightning turbos, kamikaze tournaments, heads-up tournaments, sit-n-gos, rebuys, shootouts, and satellites. The selection is impressive and offers something for every type of tournament player. Player traffic at Sportsbook.com is consistent but could use some improvement. There are usually several thousand players online at a time, which is enough to fill up tables at most levels and provide plenty of tournament action. Texas Hold'em is by far the most popular poker game offered by Sportsbook.com. If you play other poker variants, you might instead want to check out PokerStars or Full Tilt Poker. On the positive side, the light player traffic provides the players with much softer poker games than normal. Most of the players who sign up at Sportsbook.com are casual poker players looking for a little fun. As a result, the games here are easier and more light-hearted than they are at the larger poker sites. Sportsbook.com offers a variety of deposit options but credit card deposits are the most popular. The site is known for having an incredibly high acceptance rate of US-based credit cards. Credit cards that are usually blocked at other poker sites are processed without a hitch at Sportsbook.com. The minimum poker deposit is $20 and the maximum is $1,000 per day and $6,000 per month. Sportsbook.com is willing to increase deposit limits if you send them an e-mail and provide proof of your identity. Support at Sportsbook.com is definitely above average. The company has a history that dates back to 1997 and they learned the value of customer support a long time ago. Players can call them toll free 24 hours a day or contact them via e-mail. The customer support reps are courteous and take care of problems quickly. This is definitely above average for the online poker industry. Ready to Play? Visit Sportsbook Poker to Get Started Now! Now that you know everything about Sportsbook.com, it's time to play. Visit Sportsbook through any of the links on this page and use bonus code BEST1000PK to automatically receive our exclusive 100% up to $1,000 bonus.